While living a nomadic life abroad with my husband and 3 kids, I feature my favorite local eateries and shops, writing about interior design topics, fashion likes, travels and parenting journey overseas with my own photography. 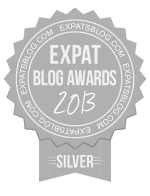 ExpatsBlog.com Expat Blog Awards 2013: India Silver Award! This blog won the Silver Award for best expat blog in India!